Ammonia and Hydrogen Peroxide free! Gentle, oil-rich, conditioning formula nourishes hair with natural moisturizers including honey, beeswax & sunflower, while providing long-lasting color without ammonia or peroxide. Safe for all hair types including chemically treated and relaxed hair. 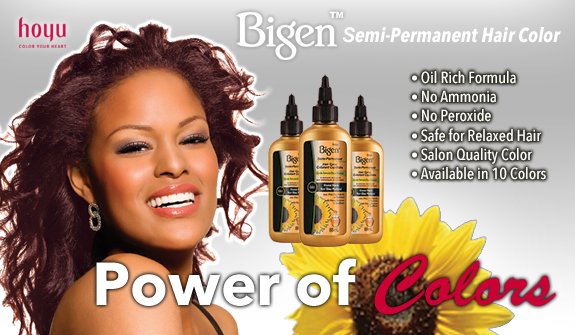 Bigen™ Semi-Permanent Hair Color leaves hair shiny, soft and beautiful with excellent gray coverage. IMPORTANT! Hair color products can cause an allergic reaction, which in certain rare cases may be severe. If you have ever experienced any allergic reaction following use of a coloring product, do not use this product. Apply generously BSP directly onto hair. Comb through. Process for 25 minutes at room temperature. Rinse, do not shampoo. Use conditioner and style as usual. Cap hair with plastic wrap and process for 30 minutes under hood dryer. Then let cool for 5 minutes before rinsing. Note: Note: Read the Instructions provided on the label thoroughly before use.